Application for refunds must be sent directly to Fastway Skip Hire for consideration by the company management. 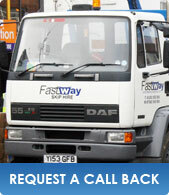 Fastway skip hire will refund cancelled skip orders in full, providing at least 48hours notice is given. If an on road licence is ordered the local authority will not refund the fee and you will still be charged.